DIANNE WHITE is the award-winning author of BLUE ON BLUE (S&S/Beach Lane Books), illustrated by Caldecott medalist, Beth Krommes, GOODBYE BRINGS HELLO, illustrated by Daniel Wiseman (Houghton Mifflin Harcourt), WHO EATS ORANGE, illustrated by Robin Page (S&S/Beach Lane Books), and the forthcoming, GREEN on GREEN, illustrated by Felicita Sala (Beach Lane Books, 2020). She holds an elementary bilingual teaching credential and a master’s degree in Language and Literacy. In 2007, she received her MFA in Writing for Children and Young Adults from Vermont College of Fine Arts. After 25 years teaching students of all ages, Dianne now writes full-time from her home in the suburbs of Phoenix, Arizona. 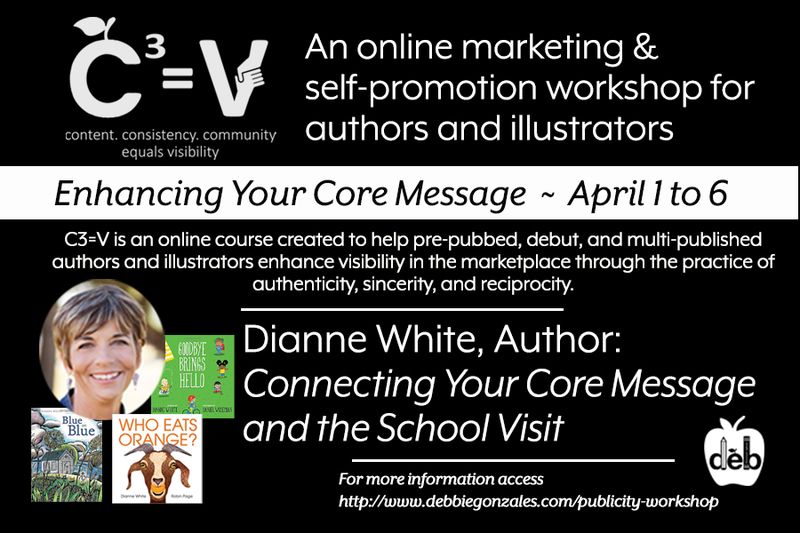 Visit Dianne online at diannewrites.com. [02:10] Finding your school visit WHY?